Chesterland, OH. (April 23, 2013) The 2013 Greater Cleveland Miniature Show, sponsored by the Miniature Cellar of Chesterland, Ohio, will be held Sunday, May 5, from 10 a.m. to 4 p.m., at the Willoughby Hills Community Center. The community center is located at 35400 Chardon Rd. (Rte. 6), Willoughby Hills, Ohio 44094, conveniently located just off I-90 and I-271. Admission is $5 for adults, $2 for children, with part of the proceeds benefitting Cleveland’s Rainbow Babies and Children’s Hospital. This fun-filled event, celebrating its fifth year, features dozens of miniature dealers and crafts persons form Ohio and several surrounding states, selling their exquisite tiny wares to miniature collectors and enthusiasts. The show features a wide variety of dollhouse miniatures for sale, from museum quality collectibles to commercial pieces, as well as supplies for the do-it-yourself enthusiast. Products include designer dollhouses and room box display cases, dollhouse sized furniture, appliances and household items, artwork, musical instruments, handcrafted wicker items, flowers, trees and landscaping materials, dollhouse-sized people, animals, fossils (yes, fossils!) and one-of-a-kind accessories of all types – all scaled to dollhouse proportions. Since its inception, The Greater Cleveland Miniature Show, founded by Miniature Cellar owner, Rosemary Macedonio, has benefitted Cleveland’s Rainbow Babies and Children’s Hospital, raising money through the hospital’s ‘Circle of Friends’ department. 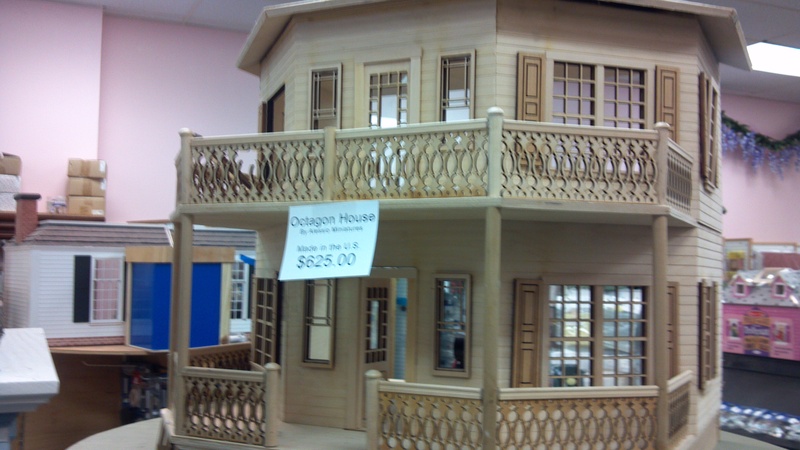 Each year, a beautiful dollhouse is raffled, with ticket sales starting in January, prior to the show. This year, we are raffling a truly splendid 11-room Federal style house. Completely finished on the outside, this miniature mansion awaits someone’s personal decorating touch inside. Tickets for the dollhouse raffle are just $2.00 or three for $5.00, and are available, in advance, at The Miniature Cellar, 12652 West Geauga Plaza, Unit A, Chesterland, OH 44026. They will also be on sale the day of the show. The drawing will be held at the show at 3:00 p.m. Attendees of the show can also purchase tickets for a Chinese auction of other items donated by our generous vendors. Several other little Rainbow fundraisers also take place during the show. This year, one of the Miniature Cellar’s wonderful customers, Rhonda, of Western Pennsylvania, drove to Macedonio’s Chesterland store, specifically to deliver 300 miniature birthday cakes that will be sold at the Rainbow table to show attendees. Both Rhonda and Rosemary will be available for interviews during the show. To make the show even more fun and exciting, attendees will be offered many incentives, including early-bird gifts, donated by Pat Catan’s Craft Centers, customer appreciation gifts and door prizes. For driving directions, a vendor list and more information on the Greater Cleveland Miniature Show, visit our website, www.clevelandminiatureshow.com and contact publicist Cheryl Dickson-Walker:(cell) 440-645-9472; studio line: 440-294-2431, or e-mail: cheryl@mediamagicohio.com .